The reader will notice that the name of this Magazine has been changed from The Freethinkers’ Magazine to FREE THOUGHT MAGAZINE. The change has been made for the reason that the latter name better expresses what we have, from the first, intended that this publication should represent. As we have stated on the first page of the cover, it will continue to be hospitable to all truth and especially devoted to the exposing of ancient error by the light of modern science and intelligent criticism, and in all things will be liberal. As the Magazine is not of sufficient size to allow of our championing every reform, we shall make it a point to attack more particularly what we consider the great bulwark of all wrong, religious superstition. Until people are divested of this thing that paralyzes the human reason, warps the judgment and blinds the intellect, they will never be able to engage very enthusiastically in the work of the various reforms that the world needs. The history of the past very clearly proves this. For instance, we can all remember the attitude that the church took on the slavery question. It has been the same with all other reforms in the past. We are sure that it can truthfully be said that no great reform movement has ever been inaugurated but what at first it met with opposition from the established church existing at the time. And history shows conclusively that the walls of superstition have always had to be battered down before scientific truth could bear fruit. We will admit that the situation has greatly improved during the last two hundred years, but there is still a great amount of educational work to be done before the human mind can be perfectly liberated. · But while we labor to destroy superstition, we propose to do all in our power to plant in its place a love for the pure, the true and the good, and above all else, we shall endeavor to be perfectly fair with all persons and institutions with which we are, for the time being, seemingly in conflict. Our methods will be eclectic. In accordance with an oft repeated saying, we shall accept the truth wherever found on Christian or on heathen ground. We are willing and glad to admit that there are many very good people in the orthodox church, but we feel sure that if their minds could be freed from superstition they would be much better. Standing: Edgar M. Sellon, Mrs. R.G. 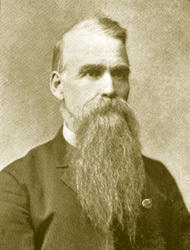 Ingersoll, William S. Bell, H.L. Green. 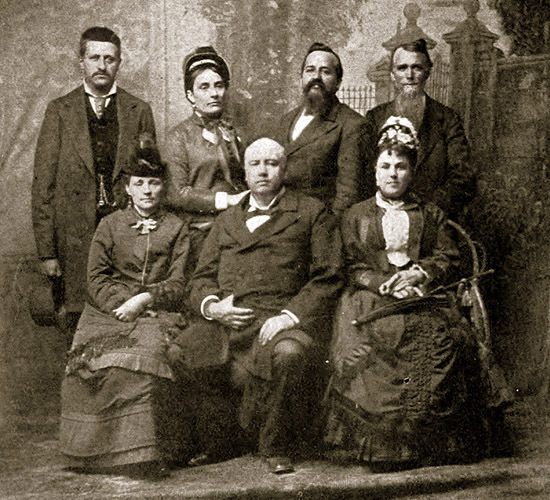 Seated: Mrs. E.M. Sellon, Robert Green Ingersoll, Mrs. H. L. Green. In fact, we think it will be very generally admitted that the most Liberal people in the churches are the best Christians; that in fact bigotry is becoming unpopular everywhere, and we are glad of it; .and we must here confess to our orthodox friends that many persons who are known as Freethinkers are not entirely free from it. We suspect all of us have more or less superstition. It is an inheritance from our ancestors, there is no telling from how far back. As to the Christian Bible, we have no war with that. All we desire is to learn the exact truth with relation to it. If any person living has any reliable and admissible evidence that proves that the God of this Universe wrote it or inspired it, nothing in the world will please us better than to publish such evidence in the Free Thought Magazine. There is some splendid things in the Bible that we love to read; for instance, the Parable of the Good Samaritan, and the definition that St. James gives of “true and genuine religion.” When the church will adopt that parable of Jesus and that definition of St. James in good faith we will gladly join it. As to the doctrine of a future existence, we would really like to come across some satisfactory evidence that there is a beautiful country beyond the stars, or somewhere else, where we are all going to after death, in which justice, love and mercy, and real happiness will reign supreme, but as yet such evidence has not come to us. Our Spiritual friends, many of whom we value very highly, say that we are obstinate and reject real genuine proof that is everywhere to be had for the asking. But the proof does not satisfy us. What would convince us would be this: Let Shakespeare write through a medium a play equally as good as those he wrote while living; or, if Ralph Waldo Emerson would give us a few chapters of his beautiful inspiration, with which he charmed and uplifted all thinkers when on earth. Such evidence would outweigh, with us, all the materializations, slate-writings and table-rappings that have taken place since the Fox girls first startled the credulous people, from their home in Rochester, N. Y., over thirty years ago. As to our Christian friends, they tell us we must take the belief of immortality on faith, but as we have not much faith in faith of this kind, it does not suffice, so we have concluded that our duty is to make the best of this present life, and we shall, therefore, as heretofore, through the pages of this Magazine, continue to labor to make this present world a little better for those who may come after us.